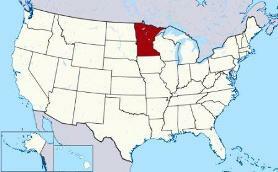 Where is the Capital of Minnesota? 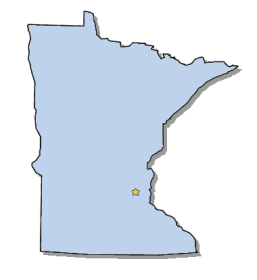 The Map of Minnesota (MN) shows the location of the state capital in the "North Star State". Minnesota has 87 counties, and the capital of the State is St. Paul. On a map, the capital city is always indicated by a star. Interesting fun facts about St. Paul including its history, location, county, current population, size of the city and the nickname of St. Paul, Minnesota. The Map of Minnesota and map provides an outline of the state, which covers 86,943 square miles. The size of the state's capital city, St. Paul, is 56.18 square miles. Test your recognition skills of the map of the state, and knowledge of its capital, with our State Maps Quiz Game. Where is St. Paul located? The location of St. Paul is on the banks of the Mississippi River in east central of Minnesota, 14 km east southeast of Minneapolis.. The city of St. Paul is located in Ramsey county, Minnesota. Each of the 50 states have their own capital city. The city of St. Paul is the capital of the state. The capital does not have to be the largest city in the state, but is usually centrally located either geographically or by population. The capital of St. Paul is the prominent city, in a political sense, as being the seat of the general government of the state where the state legislature, senate, governor, mayor and other state offices are located. Fact 4: It is the county seat of Ramsey county. St. Paul Nickname "The Twin Cities"
Fact 6: History - In 1841 a French priest, Lucien Galtier, renamed the settlement St. Paul after his favorite saint. Fact 11: St. Paul's climate has four distinct seasons. Winters can be very cold, July is the warmest month of the year with an average daily temperature of 83 degrees Fahrenheit. The number of people, or the population of the capital city of St. Paul, obviously changes constantly but the government statistics for the 2012 population of St. Paul was 290,770, which provides a good indication of the number of inhabitants of the city. We hope that the interesting facts and information about St. Paul will help kids and school children with their homework. Learn more by playing the States and Capitals Game. St. Paul Nickname "The Twin Cities"